Our dream is to paint the town green with beautiful recipes and creations featuring our Boketto Matcha, and thanks to our friends at Chairlift, North End Juice Co, Pomona, and Moon Maiden’s Delights (based in Charlottesville), that’s already been fulfilled. We love getting our matcha and other pantry staples in the hands of those with passion and creativity for coming up with something refreshing, nourishing, and delicious to share with others in the community. 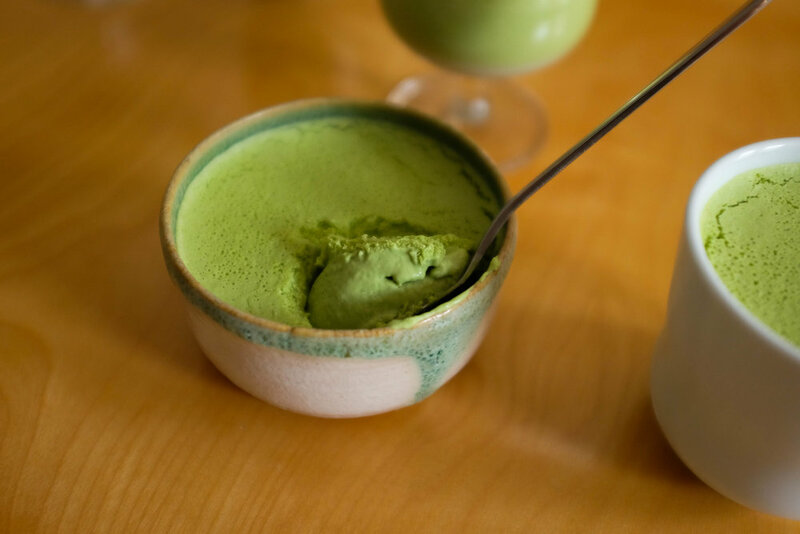 From iced coconut milk matcha lattes and adaptogen-based ice creams to blood orange green tea cakes and best day breakfast bars, we’ve been amazed to see how versatile this matcha is. Boketto Matcha is a shade-grown, ceremonial-grade green tea powder grown and sourced from a small town in Japan, called Nishio. A historic tea cultivating region dating back to the 1200s, Nishio’s stable climate, fresh pristine river waters, fertile soil, and remoteness from urban development foster tea leaves that are more resiliently green and full of nutrients. Matcha has been the focal point of Zen-Buddhist Monks for over 800 years as a revered form of art, instrument for meditation, and ingredient to health. Earthy and quite bitter in taste, matcha is rich in chlorophyll, amino acids (including L-Theanine), vitamins, minerals, fiber, and a host of antioxidants while supporting energy, mood and general wellbeing. It has quickly become a daily ritual for many seeking a caffeine alternative that’s not coffee, as it doesn’t contain the acidity that coffee typically does (and doesn’t leave you with jitters). The benefits and consumption of matcha now extends well beyond the morning cup — it’s great for blending, baking, dressing, and decorating. One of our favorite culinary allies, Allie Hemmings of Sacred Salt, dreamed up a truly refreshing spring and summer appropriate Matcha Rose Coconut Pudding that’s cut with a bit of raw honey to provide a slightly sweet breakfast or dessert indulgence. Combined with full fat coconut milk, gelatin/collagen, and rosewater, it’s wholesome for the body while supporting healthy skin and bones. Whisk or blend Boketto Matcha with a splash of coconut milk so that there are no clumps of matcha remaining. Then add all ingredients to a saucepan and stir slowly over very low heat, until warm. Pour into ramekins, cups, or glasses of choice and refrigerate for at least 4 hours or overnight. Top with anything you like and enjoy for dessert or even breakfast! Note: there is a bit of caffeine from the matcha!